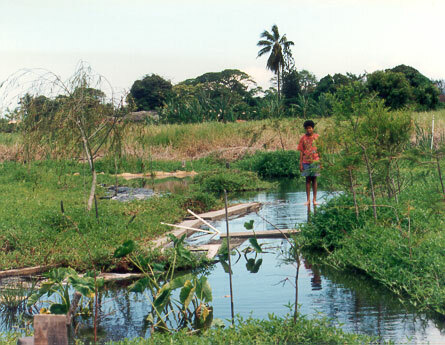 By the end of 1995 the swamp was a green field of honohono. 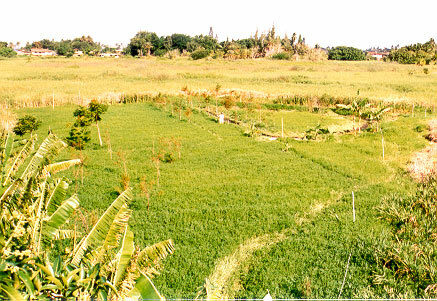 This view is from the mango tree on “the island”. I think that is Kevin out by the “house” trees all in a row. Scroll on down for more pix. 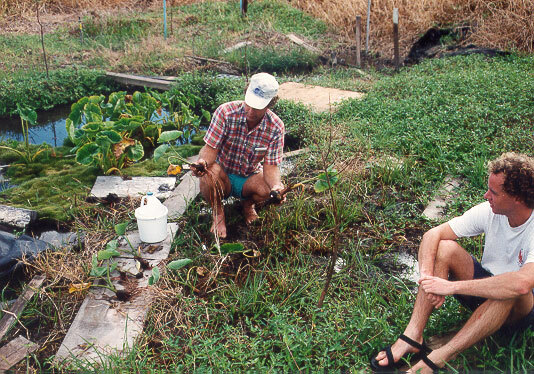 The dam is just behind Ray, who is getting taro keiki to plant as Jim looks on. A few minor details: The taro variety is Pi’i Ali’i from the guys at the UH taro patch (near where the Hawaiian Studies building is now). A few of you got to try it – it makes a delicious purple corm. 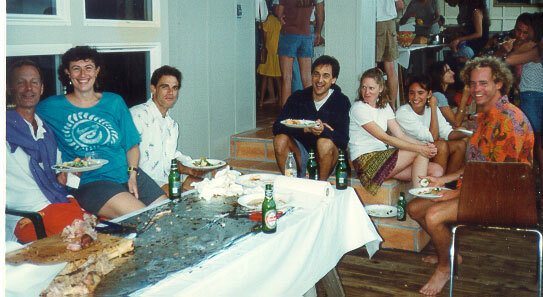 Note the jug of “huli dip” – a 10% bleach solution to kill any germs. 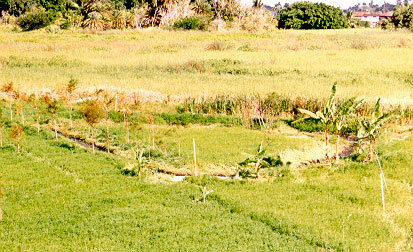 The green puffy grass growing around the taro plants came up on it’s own when the soil was just barely above the water. We called it “chia” grass. Joseph has his hands full of our fine swamp soil. I think he is raising the support for the bridge. Note by then we are using old carpet scraps to keep the honohono under control and to give a little strength to new mud construction. Building note: Our main trick to get support out of goopy mud was to let it dry a few weeks before walking on it. We also tried mixing in a little cement, fiber, etc. which worked to some degree. 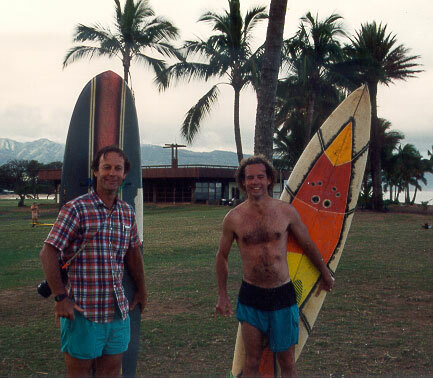 Ray and Jim caught a few waves at Haleiwa Alii that hard working day in 2/95. A more typical posture for Doug at the swamp. – July 2000. Kevin and Lucy say goodbye. Tara in the taro ditch, here right thru the center of the house trees. Note even with carpet lining the sides (barely visible) the honohono is creeping in. This picture is not super clear, but it marks a fine moment. Aug 12, 2000 was our first day with about 4 times the firepower with RoundUp. We used to use just a 1.5 gal sprayer. We got a new 2 gal sprayer, plus 2 handheld “six-gun” sprayers, plus three 1-gal jugs to bring extra juice. In the picture Ray has the 2 gal sprayer, and Arnie has a six-gun in each hand. The breeze blew the cattails so his don’t really show. It is about time to head on down the road. 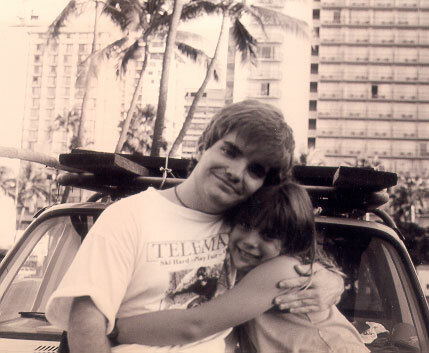 In the honohono years our access was by way of the Tantog family’s road (off of Achiu Lane). We did not have a legal right of way, but they let us slide. 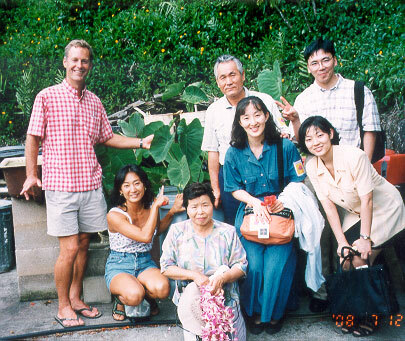 We were careful to not go on weekends (they often had family functions down on the “island”). We sprayed weeds on the way in, and gathered trash on the way out. 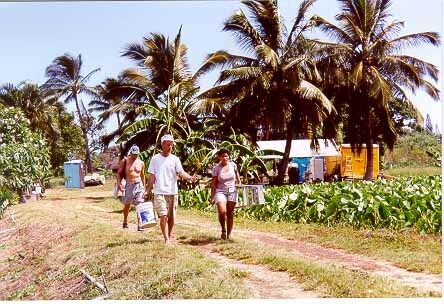 Here are John, Ray, and Julisa after a tree trimming session in July 2000. After all the clearing, we noticed the swamp tended to drain. 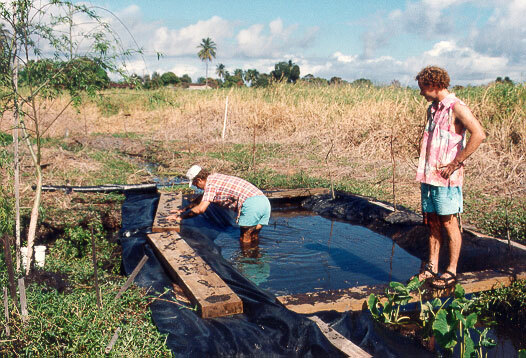 The advantage of taro being submerged is that very few weeds can get started if there is a layer of water over the soil. So we built a dam on the little waterway. 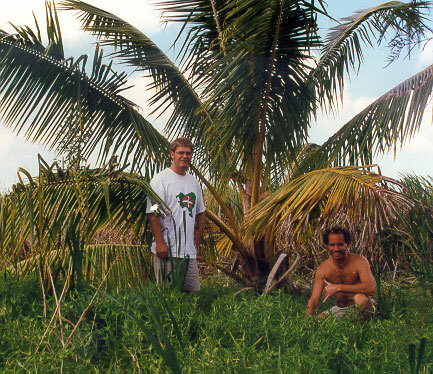 This photo from 2/95 is just above the dam, in our most ambitious taro lo’i. Jim is making sure Ray is not slacking. Some days the water level in the swamp is higher than others. Sometimes it seems like it is from recent rains, but other times there is no apparent reason. Since the water probably springs up from ground water, it may have to do with how much our neighbors are pumping or something. (Recently Mark Underwood, PhD in coastal groundwater, suggested we look for tidal influence.) Here is Rechung standing on one of our bridges in June 95. Also note the taro patch is being encroached by honohono from the sides. 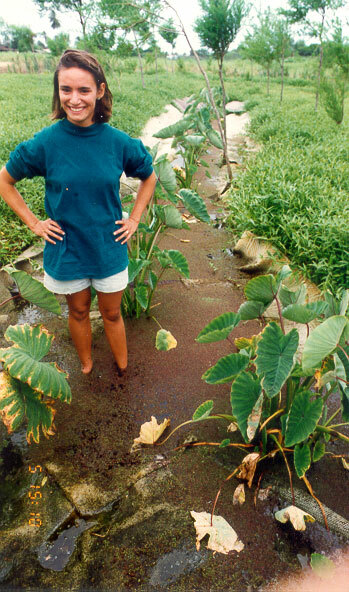 Here is an overview of the taro ditch at its peak in 12/95. The natural waterway is in the back where the honohono is extra green. 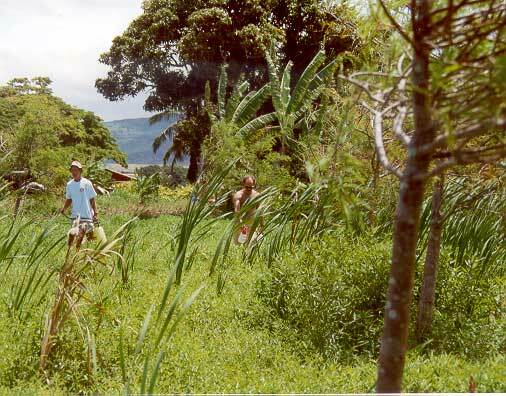 Sam, Doug, Ray, and Lucy (head) trying to clear the taro ditch in Oct 95. We eventually lost it. Note that Doug is dirty and working, which is, ahem, not his usual swamp mode. *SIGH* – In about 1995 we lost two fine swampers to the Tuscany hills. Here is one of our last surf sessions at Pops with Gianna. Kevin was toast soon after. Joining us were Roberta and Collum. And the bird. Isabella got us an invite to a fine lamb roast up at John and Colleen’s. 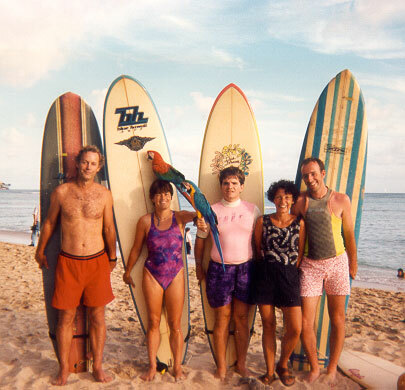 Swampers from left – Ray, Anna, Joseph, Vinny, Marcia, Tara, and Jim. 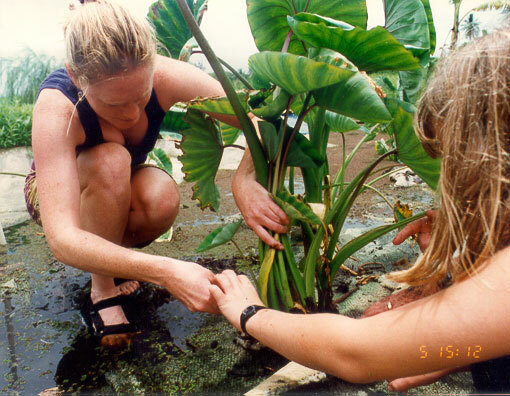 Marcia and Lucy tending the taro in July 1996. Hang on – we’re almost done. We won’t drop you in the toilet bowl. In Nov ’96 Mary, Abe, and Lucy went to Iowa to set up a new homestead there. 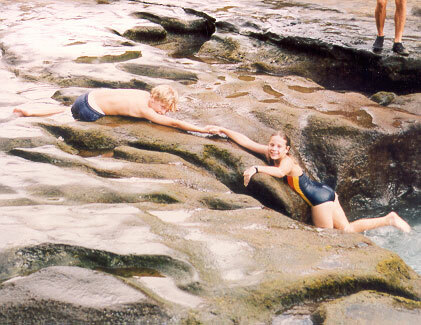 Here Abe and Lucy are back on Spring break 97. I also go to Iowa a few months later. Visits to the swamp become few and far between for me for a few years. Jim and Doug also trundled off for a few years, to that fine city by the bay. They took on the surf at North Beach, with full wet suits of course. Here Jim and Jim are testing their newly made longboards at Bolinas. 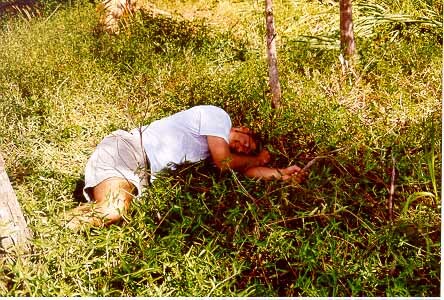 We added a new coconut to our plantation in Feb 01. Here is Nancy with the sprouted coconut. 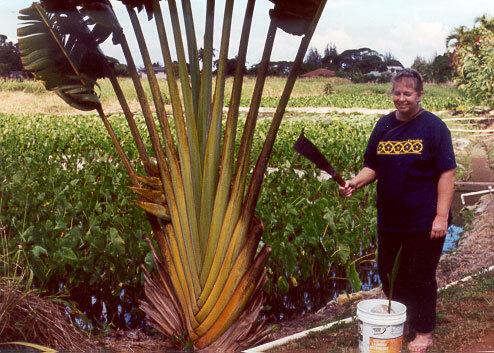 She is beside one of the neighbors’ “real” taro farms, along the road. 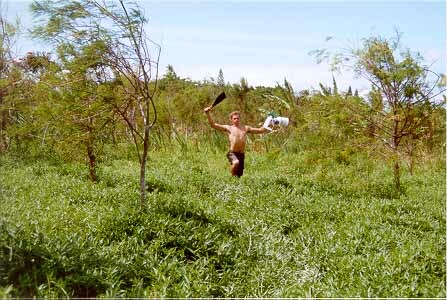 Here is Jason running thru the soft honohono grass in Aug 2000. If you want more pictures, run on to the next page.